"With close to 20 years of experience as a member of this House, you have the honour of presiding over it. Since you have been a long member, you obviously know the tradition, the culture and the functional style of this House," Mr Jaitley said, addressing Naidu in the Rajya Sabha. 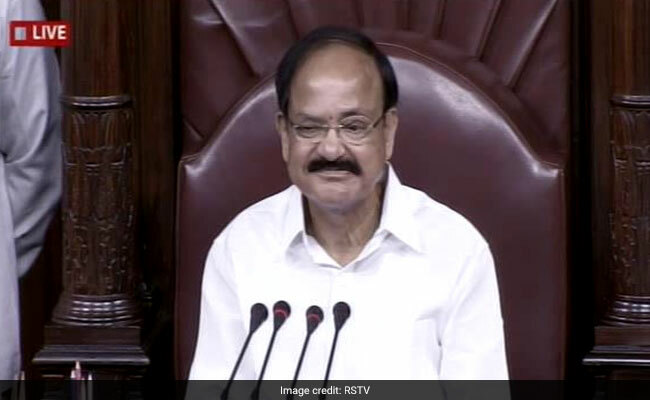 New Delhi: Finance Minister Arun Jaitley on Friday welcomed Vice President M. Venkaiah Naidu as Chairman of the Rajya Sabha, and said that his experience as a member of the Upper House would help in its effective functioning. Mr Naidu on Friday took over charge from M. Hamid Ansari whose second term as Vice President ended on Thursday. President Ram Nath Kovind earlier in the day administered the oath of office to the new Vice President at Rashtrapati Bhavan here. Mr Jaitley said there have been times when the relevance of Parliament has been pushed into the background. "It's a good principle of not passing bills in a day. This principle has been strictly adhered to post 2014. Prior to 2014, there was no such principle." Noting that Parliament is a legitimate forum where debates and discussions should be held, he said "matters of public interest raised by the opposition or other members must be given adequate time, but there is a balancing act to be performed". "Give time to discussions, also leave some time for government business. You (Naidu) will be able to strike a balance between the two. With this kind of balance, we will be able to conduct the House very well," he added. Meanwhile, West Bengal Chief Minister Mamata Banerjee on Friday congratulated India's new Vice President M. Venkaiah Naidu. "Congratulations M. Venkaiah Naiduji on assuming office as the Vice President of India. My good wishes," Ms Banerjee tweeted. Mr Naidu took oath on Friday. Nominated by the ruling BJP-led National Democratic Alliance, he won the vice presidential poll on August 5.